What is the first thing you want to try when traveling to any place? For me, it’s always the street food. Those bits and pieces, here and there always contain the produce, the flavours and the spirit of a place. It is fascinating how much street food tells about a destination! The perfect introduction. So when we landed in Amman, and having grown up there, I wanted to show the ladies I was traveling with the city and have them taste some of its best loved street food. I felt I wanted to show them, why I love this place, where we hung out back in the day and give them a quick feel of Amman and what better way to do that, than by having them taste the stre et food of Jordan? 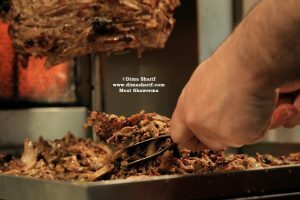 So we head out to Shawerma Reem, one of the most popular and best loved meat Shawerma places in town. I myself had missed it so much, and knew they would love it! The whole experience is different from any other Shawerma place. You would queue for a while until you get your shawerma (the place is usually packed), all the while watching the guy slice off shavings of caramelised meat, which he then places in pita bread, drenches with Tahini sauce and adds a few slices of tomato, red onions and sprinkles the whole with chopped parsley and sumac, then rolls… you bite into it and you can’t miss the tahini, the meat and get woofs of sumac and onion… absolute pleasure! We each had a few and could not stop at just 1! Shawerma Reem is located in Jabal Amman, close by the Intercontinental hotel. A must try when in Amman. It was already afternoon and we wanted a good cup of coffee to keep us going, and since we were close by, I thought to take them to Books@Cafe, which is my favourite cafe in town. This is where I used to hang out with my friends since school days. Every so often we would go there and spend the whole afternoon out on the terrace, overlooking the beautiful Mountain studded with very old houses; a beautiful scene of old Amman. Books@Cafe, being located in the first circle of Jabal Amman, is in one of the oldest neighbourhoods of the city. Some houses there are well over 70 years old, so immediately you are in the presence of the city’s history, its old structure, and iconic enduring stone houses. You take a look around, see the many windows and terraces and can’t help but wonder the lifestyle back then. A place with houses so closely knit with windows and balconies overlooking the whole neighbourhood. Had you spoken, the neighbour would have heard you, and the streets are very narrow, however everywhere you look there is a picturesque view. This area is very close by Rainbow street, which back in the day used to house the most famous and posh shopping stores, now turned into a cafe and restaurant strip. It is also close by Al Abdali, which has always been the public transportation hub of the city as well as being so close to downtown Amman, which had always been the trade centre of this city. So rightly, back in the day, these people who lived in this area lived at the centre and the heart of Amman. While the city grew and hugely expanded, these areas remain a centre and carry out much of the city’s unique character. Ever characteristic of this city, Books@Cafe looks like it belongs to another era from the outside, however, very art deco on the inside, with the book shop section greeting you as you enter and the cafe on top treats you with its multi coloured, hand-painted walls, remixes of the most famous 90’s tunes and some delicious treats all in the presence of amazing scenery from Old Amman. Beautiful, and I could not be happier that a good thing has not changed! If you do go to Amman, dedicate a day for strolling down Rainbow Street. The strip is filled with cafes, restaurants, pubs and pub gardens among others but really the best thing about it is that it is a historical part Amman, the one that paved the way for modern Amman to evolve. I also recommend that you visit Souk Jara during the season it operates. This is an artisanal open market in which you will find many souvenirs and beautiful pieces by local makers including, cross stitching (pillows, clothing, table runners…), hand painted plates, cups, trays… and many more beautiful things. There are often performances and concerts there as well, so it is an all round fun activity showcasing Jordanian talents. Since we are talking cafes, another one of my favourite cafes in Amman is Blue Fig Cafe in Abdoun. The ambience of the place and the back terrace are gorgeous. One of my favourite spots for sundowners. Music is always good there (they promote local musicians and artists) and the food always intriguing! They have completely revamped the Manqooshe (bread pastry) concept. Their pesto pastry and turkey and cheese one are to die for (I always order them there). Even their burgers are very different from what you would normally refer to as a burger! Must try! The day was quickly unwinding from then on. We had unfortunately missed on the delicious Kaek Bisimsem (Sesame coated bread rings filled with zaatar, cheese or boiled eggs), never had enough time! But when in Amman, make sure you have some of these. They are usually sold on strollers in Al Abdali area, Sweifieh or the 4th circle close to Al Khaldi Hospital. It was not until the second day that we went on the proper street food hunt! Because, you have not tasted Street Food in Amman, until you have had the Falafel, Hummus, Fool, & Fattet Hummus… breakfast! Then followed that with Knafe from Habiba! That is it. This is the street food ritual in Jordan, and an absolutely delicious one, that you really want to go on! 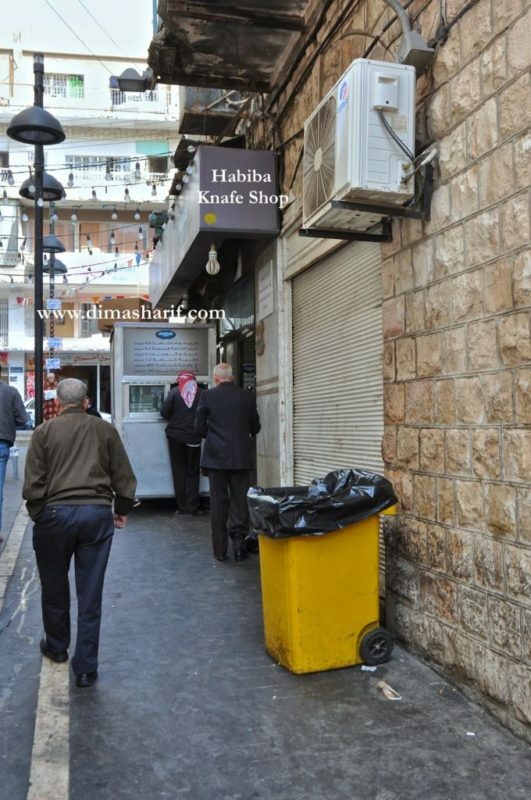 The most famous Hummus breakfast shops include: Hashem Restaurant in Al Balad (everyone’s favourite), Al Kalha in Sweifieh or Abdoun, Abu Jbara in Tla’ Al Ali. All of which are highly recommended. The most famous Knafe and Arabic desserts shops include: Habiba Al Balad, Zalatimo, Abu Sir (must try their warbat or shueibyat, Ah Divine! )… All of which are very recommended. The second day, we did just that and but because we were on a tight schedule, of course we could not try everything, however managed to squeeze in the most iconic ones, including Shawerma Al Daya the best loved for chicken Shawerma. We have even gone on a Sahlab hunt (sahlab is a milk mixture that is thick and served with nuts and desiccated coconut on top, really delicious and especially during winter, very heartwarming). We looked everywhere and while this drink was always readily available even at the sides of the street, that time it was hard to find! We did find it eventually in Gerard an ice cream shop in Abdoun, and it was everything I hoped for. Fantastic and recommended! Finally, do drop by the produce markets, because produce in Amman is really outstanding. It is all real and smells of the produce. You peel a cucumber in one room, and the whole house smells of cucumbers. The strawberries are marvellous, the oranges, pomelos, the prickly pears… all is to die for! MY Diaries – Little notes I wrote during this trip. When we keep our mind open to new ways, new things and new flavours we allow ourselves to experience the essence of a place and therefore allow ourselves to connect the space in between. We must never take home with us when we travel, and must know that everywhere is unique and different and that is why travel is a beautiful activity. If we expect to find only the familiar, the sameness of home, then we might as well stay at home! When we are being overly critical and looking for things to dislike then we will find just that! Things to dislike and more space in between. But when we are looking for the unique characteristics, flavours and ways of a new place, we are then exploring and allowing ourselves to discover. That is true adventure!